People around the Bay Area, the state, and the nation are thinking about what they can do to help victims of the North Bay fires. For a pair of socially minded artists, it turned out their efforts were worth much more than they’d ever imagined. Annie Galvin is a painter. Eric Rewitzer is a linocut printmaker. They’re married, and together they own a little gallery, store, and workshop called 3 Fish Studios in San Francisco’s Outer Sunset District. One of their most popular items is a print of a bear hugging a map of the state of California. 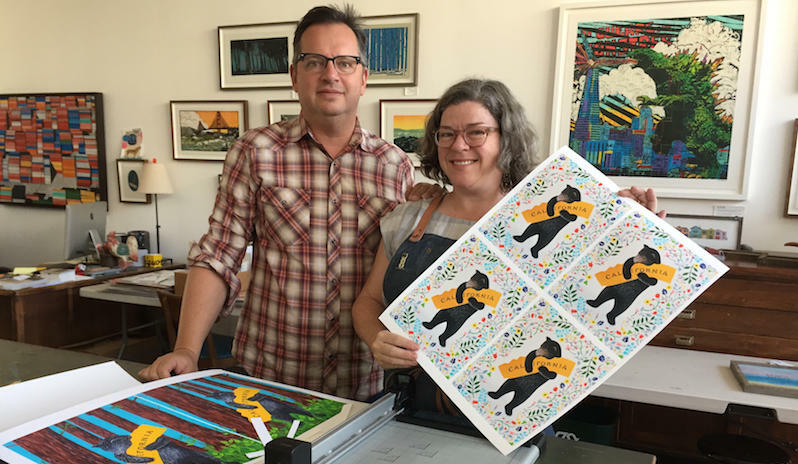 It’s modeled after the image on sheet music for the official state song: “I Love You California.” Annie starts with that bear and paints various floral backgrounds around it, like California poppies or redwood trees. 3 Fish Studios is a community hub in the neighborhood where KALW’s Ben Trefny lives. So it’s no surprise that Annie and Eric wanted to do something to help victims of the fires. What’s surprising is just how big their effort became.